The Trustees of Wymondham Dementia Support Group are pleased to announce the appointment of Dianne Fernee as the Organiser of their services, namely, Wymondham Pabulum Café, The Singing Café and The Pabulum Picture Palace. A dementia support group based in Norfolk has recruited the help of a recording company to help produce its first CD. Members of the Singing Café, which is run by Wymondham Dementia Support Group, recorded an 18-song CD with Norwich-based Ashwood Recording Studios. Andy Pandy, disguised as Town Mayor, Dianne Fermee, cut the cake and we also celebrated ‘Time for a Cuppa’ a national campaign organised by Dementia UK to raise funds for Admiral Nurses. A raffle to support this fund raised £130 and the main prize, a wine and food hamper, was won by Jim Rump. Mid Norfolk MP George Freeman attended Wymondham Dementia Support Group’s café today, which supports around 30 people with dementia and their carers. The group has been running for the last four years and the singing café delivers music therapy to help improve the health and wellbeing of its members. 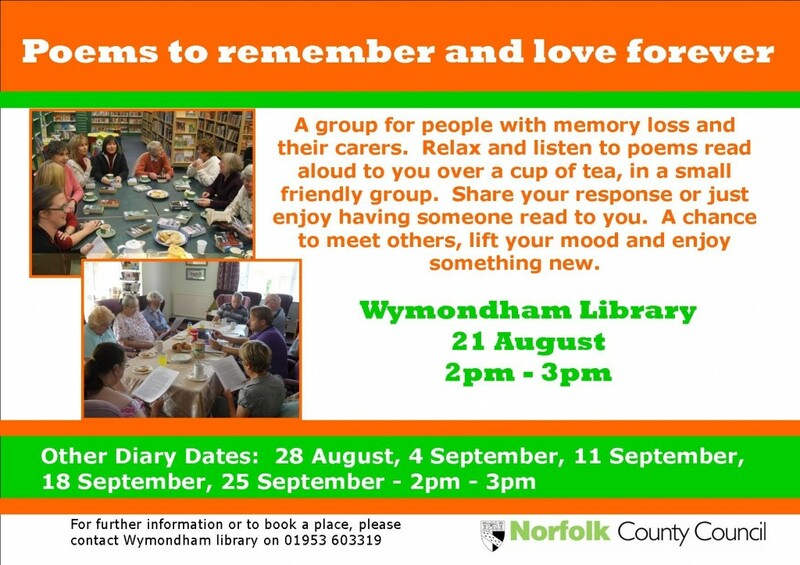 On the evening of Thursday 12 September, Wymondham Dementia Support Group and Age UK Norfolk are holding an event to celebrate the beginning of new project which will see the local community come together to support Wymondham to become a Dementia Friendly Town. A support group for dementia patients and their carers in Wymondham celebrated its birthday with news of an extended service and new website.